Share the post "NJAES Tree Fruit Breeder Joe Goffreda (CC’83) Named “Inventor of the Year” for Patented Peach"
Joe Goffreda standing in front of a new selection that was derived from a cross with ‘NJF16’, the variety that earned him the “Inventor of the Year” honor from the NJ Inventors Hall of Fame. Photo credit: Brandon Cantarella. Joseph Goffreda (CC’83), associate professor of plant biology and pathology and director of the Rutgers Fruit and Ornamental Research Extension Center was one of seven individuals honored with the “Inventor of the Year Award” by the New Jersey Inventors Hall of Fame on Oct. 22. Goffreda shared the spotlight with two other Rutgers professors, Peter Lobel and David Sleat, professor and associate professor in the Rutgers Robert Wood Johnson Medical School’s Department of Biochemistry and Molecular Biology, who received the organization’s “Innovators Award” for developing the first-ever effective method to deliver therapy for a progressive childhood illness known as Batten Disease. Goffreda was honored for breeding a hybrid peach (NJF16) marketed under the name TangOs®, which has a combination of attributes attractive to commercial producers and consumers, yet is resistant to major diseases, particularly bacterial spot. Goffreda and Anna Voordeckers, who retired in August as a lab technician with the Rutgers tree fruit breeding program for over 50 years, set out to develop a unique peach with excellent flavor. “Voordeckers, my co-inventor of NJF16, and I decided to combine the genes for a flat peach shape, heirloom cling-peach flavor, and the complete lack of any red over-color, so that the fruit would be visually striking and readily identified by the consumer,” explained Goffreda. After Goffreda and Voordeckers chose the “parents” and made the cross in the field, they planted the seeds from the cross and waited for four years for the trees to bear fruit. Their patience paid off. “It’s difficult for me to describe our level of excitement when we came upon the fruiting seedlings from that cross, and saw ‘NJF16′ with the exact combination of characters that we desired,” he added. 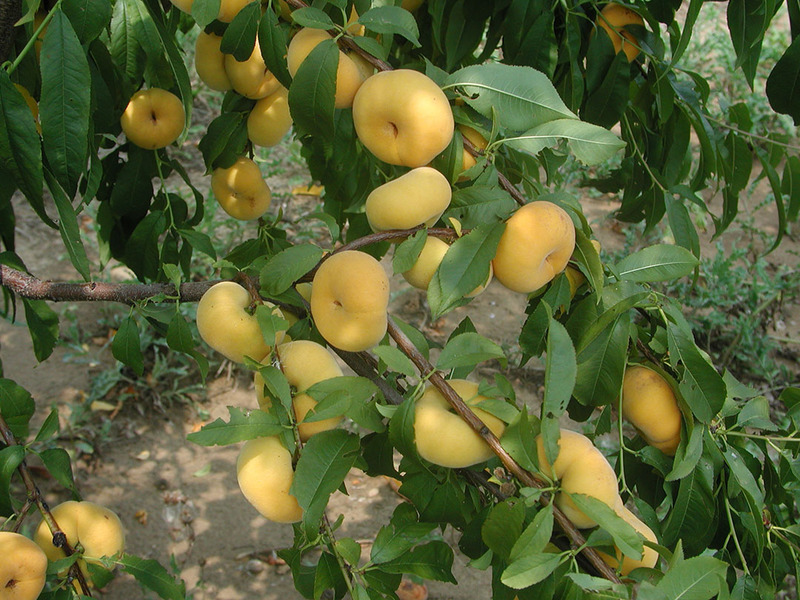 Branch laden with peaches from Goffreda’s invention, ‘NJF16’, with its signature yellow skin color and outstanding flavor. The process of growing and breeding peaches is lengthy and complicated, and involves quite sophisticated technology, explains Brad Hillman, director of research at NJAES and professor in the Department of Plant Biology and Pathology. “It can take from 12 to 20 years to develop a sound, science-based program that includes breeding plants for evaluation, conducting plant trials in different locales, and going through the arduous testing for disease resistance, pest resistance, environmental extremes, productivity and yield,” said Hillman. 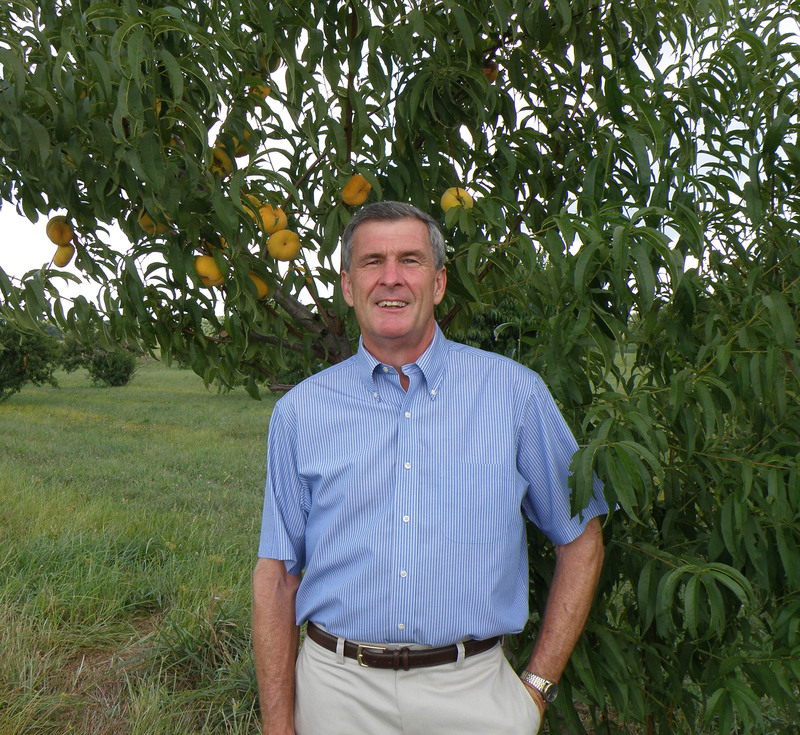 Goffreda has developed 11 other patented peaches and his cultivars have proved to be highly suitable for production in the Northeast and mid-Atlantic regions. The commercial success of peach varieties such as TangOs® contributes to New Jersey being ranked among the leading U.S. states in peach production, per data from the USDA National Ag Statistics Service and USDA Agricultural Marketing Service. TangOs® is licensed to Adams County Nursery, a long established commercial grower in Pennsylvania that partners with Rutgers on testing and propagation of this and several other peach cultivars. Rutgers has received over $100,000 in royalties from this single peach variety, attesting to its attractiveness to both growers and consumers, added Hillman. The tree fruit breeding program at Rutgers New Jersey Agricultural Experiment Station began in 1907, introducing varieties that have become standards in the fruit industry and bred for their excellent eating quality, winter-hardiness and disease resistance. Goffreda, who also has 12 patents for apples, apricots and nectarines, has led the Rutgers tree fruit breeding program since 1989.